If you purchase Arcadia Chamber of Commerce’s products and services, we collect billing and credit card information. This information is used to complete the purchase transaction. Please keep in mind that if you directly disclose personally identifiable information or personally sensitive data through Arcadia Chamber of Commerce’s public message boards, this information may be collected and used by others. General contact information for member businesses is provided as a service on the Arcadia Chamber web site. This information also may be shared, on request, with other members. From time to time the Chamber may provide web site users the opportunity to participate in contests or surveys. If you participate, we will request certain personally identifiable information from you. The requested information typically includes contact information (such as name and shipping address). We will not share your street address or phone number, nor will we share mail addresses gathered via contest entries. 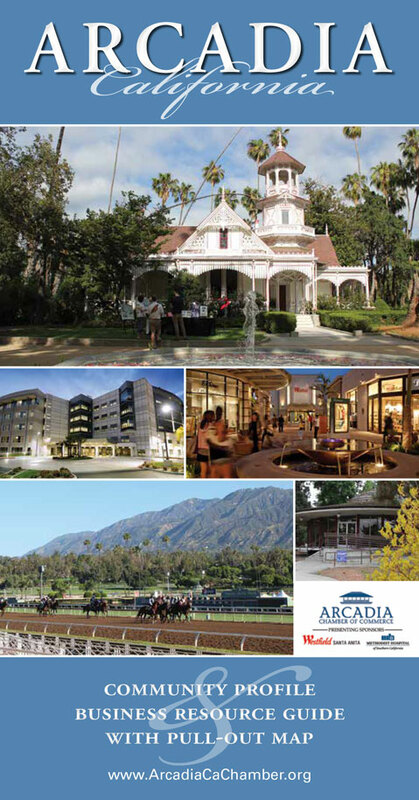 Arcadia Chamber of Commerce uploads pictures and video for the purposes of sharing events, individual achievements, business promotions, member activities, and/or news and information. All pictures and video are done in public with complete knowledge of the person and/or persons and used publicly. Arcadia Chamber of Commerce does not embed location data for maps like GPS or data for EXIF. Arcadia Chamber of Commerce collects and uses your personal information to operate its website(s) and deliver the services you have requested. Arcadia Chamber of Commerce may also use your personally identifiable information to inform you of other products or services available from Arcadia Chamber of Commerce and its affiliates. In some cases, where a page on our website includes content from a social network, such as a Twitter feed, or Facebook feed, those services may set a cookie even where you do not click a button. As is the case for all cookies, we cannot access those set by social networks, just as those social networks cannot access cookies we set ourselves. Arcadia Chamber of Commerce does not sell, rent or lease its customer lists to third parties. Arcadia Chamber of Commerce may share data with trusted partners to help perform statistical analysis, send you email or postal mail, provide customer support, or arrange for deliveries. All such third parties are prohibited from using your personal information except to provide these services to Arcadia Chamber of Commerce, and they are required to maintain the confidentiality of your information. Arcadia Chamber of Commerce may disclose your personal information, without notice, if required to do so by law or in the good faith belief that such action is necessary to: (a) conform to the edicts of the law or comply with legal process served on Arcadia Chamber of Commerce or the site; (b) protect and defend the rights or property of Arcadia Chamber of Commerce; and/or (c) act under exigent circumstances to protect the personal safety of users of Arcadia Chamber of Commerce, or the public. Information about your computer hardware and software may be automatically collected by Arcadia Chamber of Commerce. This information can include: your IP address, browser type, domain names, access times and referring website addresses. This information is used for the operation of the service, to maintain quality of the service, and to provide general statistics regarding use of the Arcadia Chamber of Commerce website. Arcadia Chamber of Commerce does not knowingly collect personally identifiable information from children under the age of thirteen. If you are under the age of thirteen, you must ask your parent or guardian for permission to use this website. From time to time, Arcadia Chamber of Commerce may contact you via email for the purpose of providing announcements, promotional offers, alerts, confirmations, surveys, and/or other general communication. In order to improve our Services, we may receive a notification when you open an email from Arcadia Chamber of Commerce or click on a link therein. If you would like to stop receiving marketing or promotional communications via email from Arcadia Chamber of Commerce, you may opt out of such communications by clicking on the UNSUBSCRIBE button..